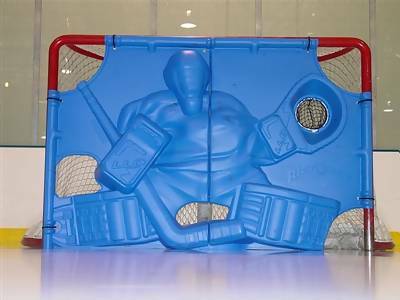 Rick-O-Shay goal blocker is "Hockey's most realistic goal blocker"
Rick-O-Shay is the world's first 3-Dimensional goal blocker. Durability, creativity and realism combine to make Rick-O-Shay the best substitute for an actual goalie on the market. Some might contend it is actually even better than a real goaltender. Rick-O-Shay is constructed of a High Molecular Weight Plastic. In hockey talk that just means this is a tough, resilient material. Whatever blistering slapper you think you've got, it will turn it aside like it was shot from your grandma. Basically, we did not design something that wasn't going to hold up to the wear and tear of everyday use. Indoors, outdoors, on the ice or on the pavement, no special balls or pucks are needed to use this goal blocker. Not only does Rick-O-Shay look like a real goalie, it acts like a real goalie too. Objects shot at it deflect away in an infinite number of directions and speeds. The unpredictability makes for exciting action during game play and practice. With Rick-O-Shay, you never have to worry about the goalies showing up again. Imagine playing anytime, anywhere and having a goalie! This three dimensional thermoformed goalie will make the puck react just like a regular goalie. Giving up rebounds and deflections in an infinite number of directions, just like a real game. Rick-O-Shay can even make real glove saves to stop the play for even more life-like action. No more shooting at a flat piece of plastic or wood and having the puck just lay there for easy tap in goals.